LITERAL ADDICTION has had the extreme pleasure of hosting some absolutely amazing authors over the time that we've been around. We've had some super entertaining posts, chats, and more, and cannot wait to see what other amazing talent we can uncover for you all and what other bookish information we can share. Below is a list of our V.I.Ps. If you click on their name, you can go to our Tumblr Archive blog and check out all of the Author Events we have done with and for them. There are some great ones out there, and even though some of the earlier ones don't look very well format-wise (I was still trying to figure out how to use the VERY limited Tumblr to it's full capabilities at the time) the content is still there, and is worth a look-see if there's an author you love or are curious about! Make sure to check out all of this page's sub-pages too - Author Interviews, Author Ambushes, Book Blasts & More, New News Nook and Author Chat for all of the current Author Events. ~This is Rheid. 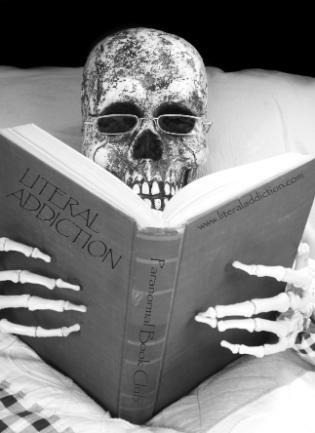 Rheid is LITERAL ADDICTION's official mascot and proof that LITERAL ADDICTION is where book addicts and paranormal junkies unite! Rather Peruse by Post Agenda? If you are a member/follower and would like to help LITERAL ADDICTION's Administrator with the costs of maintaining the site & chatroom, shipping costs for Contest winners, etc, this is a way to do it.